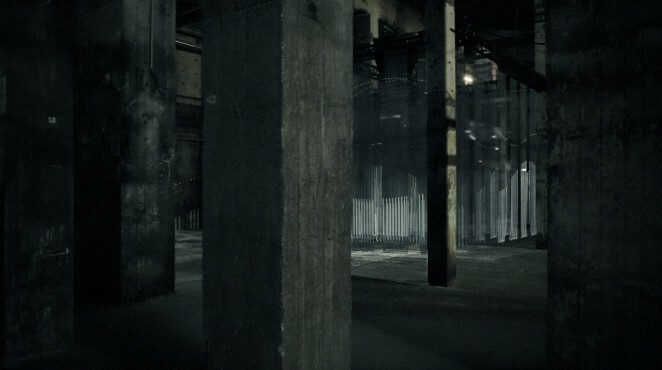 In the summer of 2013 we were invited by the Berlin Atonal festival to present the piece at the Kraftwerk berlin, a former power station in Berlin’s Mitte. Disused in 1997, this piece of Berlin’s industrial history which used to power the former East regions of the city, is now converted in an exhibition and event space. During our scouting visit we were immediately seduced by this cathedral of concrete where giant pilasters and steel girders create a scenery of post industrial uchronia. The ideal set for a piece such as 3Destruct. Thanks to a high standard an uncompromising music programming the event was a real success. Murcof + Simon Geilfus’s live performance, another project of the Antivj label, was also presented during the festival. We are taking this opportunity to present you this new take on the installation, and to announce that 3Destruct will be back in Berlin, this time at the Opernwerkstaetten, from April 10th to May 25th 2014 during Photography Playground.